I make this post as a public service, from one person who could not find answers to the “System Filling” error on a Jura super-automatic. Weeks ago my Jura C9 displayed the message “Change filter”, prompting me to put in a new Claris filter. I am not sure if I missed a step or did it wrong, but all of a sudden I kept getting the error message “Press Rinse” followed by the message “System Filling” and nothing happening. Over and over and over and the terrible loud grinding noise making me cringe (and I stood there envisioning a pump burning out). Fill your water tank with hot water (not boiling) and press the rinse button a few times. That may have worked if there was an air bubble in the line. The way to prevent air bubbles with the Claris filter is by emptying the water, putting in the new filter, refilling the water and going through the filter rinse cycle. In my case, no joy. I tried to call Canada help (because there is no Jura dealer in Japan) but each time I was too late (Jura closes at 5PM in Canada, 6AM in Tokyo). Very frustrating. So I emailed them and a technician emailed me back suggesting I call in. I explained my time zone issue and he did the amazing, he sent me his cell phone and said he would help me after hours. We talked at length and he helped me solve my problem. Now, for those of you who have a depot nearby, I would probably not do this. I would take it in for service as it required opening the machine. First – pop the side off your Jura. This is what mine looks like – looking at the right side. Looking at the side panel in the bottom left there is a pump. It looks like this. Pull the little metal clip out and pull the plastic pipe out. Next, the “cream” coloured piece where you removed the pin from needs to be removed. You do this by “unscrewing” it from the white piece which goes into the boiler. Below is what it looks like with the cream piece removed. Now take that little piece with the micro filter and attach it to a compressor and blow it out. Trying to do this manually will not work (i.e. blowing in it). I had to drive to a gas station and use their compressor to truly get the bits out as my compressor is in my father-in-laws garage. Then simply reinsert. Turn on the machine and the boiler should prime and you are good. Once confirmed, put the sides back on. I have had 2 Juras and used filters in both with this never happening. Hopefully it never happens again. To avoid it in the future, empty the water container first, put in your new Claris filter, add water and then turn on the machine (in other words – follow instructions) and pray that random carbon chunks do not leak out. This entry was posted in Garden & Home, Random Thoughts and tagged C9, Change filter on Jura, Claris filter clogged, Jura, Jura system filling but will not fill, Press rinse, Press steam on Jura by michaelweening. Bookmark the permalink. Thank you!!!! Yes this helped me tremendously. I don’t even use filters but somehow some crud got in there and was stopping up the works. You are welcome … it was painful to figure out! Thanks for your help,i also had the same problem but cleaning the part pushing pressurized air from output side pushing air coming out of the inlet. how do you unscrew the cream piece? I can’t do it!! also if I succeed to remove it where do I blow the air in? in the part that goes in the white piece attached to the boiler or the part where the water line goes in? Your help answering both questions is highly appreciated!! Thanks. A few things. First of all when I did this I had a Jura technician on the call with me. I would recommend that. If I had a choice, I would not have done this on my own, I would have paid the $50-100 and them do it. But I am in Japan. As I say in the post – you do not unscrew it. It is a pin that you pull out and then piece comes apart. You blow the air through the yellowish looking piece. That is what was clogged for me. But you will need to use a compressor and be careful. Um – yes, yes you do. here is your quote: Pull the little metal clip out and pull the plastic pipe out. Next, the “cream” coloured piece where you removed the pin from needs to be removed. You do this by “unscrewing” it from the white piece which goes into the boiler. In answer to marilou’s other question, you would blow back from the boiler side towards the hose connection, as the crud needs to come out the way it came in – from the hose. Thanks for sharing and for the help! Hi Gwynne, believe it is screws on the back. Thank you and God bless you!!! Just by rinsing the machine with hot water did the trick. I just changed the filter recently and could not think might be at fault, until it hit me one night. I googled “system fill” and found your help. You have made my husband a happy man. THANK YOU !!!! I have my coffe back !!! Thank you so much for taking the time to post this. Worked immediately using the “hot water” tip and avoided a potentially costly repair bill…. and, more importantly, we still have our fantastic Jura coffee on demand. The machine was caught in a perpetual system filling mode. The wife called support and they had her do a number of things. One was to remove the Clearyl filter and cycle warm water through the machine. Nothing worked. I came home and tried all the same things … nothing worked. I then ready your story. I tried hot water. It worked. Put the filter back in and it failed mid-cycle. Then the Clean alert came on … very dirty water. Then we used a new filter, installing it according to directions. It asked us to run the filter rinse cycle twice. It now seems to be working properly. If there are problems, we will report back! Annoying isn’t it Michael? I had this happen to me AGAIN – 3rd time with this unit – fortunately I am back in North America and they fixed it for free. Turns out they are having this problem with the micro-filter. I no longer use their filters – as they are the cause for this I believe – as there are little black flecks (The Jura filters are charcoal). After explaining this is time number 3, they did it at no cost (This is also my 3rd Jura – and have had the most problems with it). I have RO water with a re-mineralizer on it also, so do not need it. But very frustrating! Michael, thank you for your time and effort. I carefully read your article and also the follow up comments. I’d like to make some clarifications. First of all the “orange” piece on your picture is NOT a boiler. This is 18 bar Invensys CP3A 55W 120V water pump. Second, “cream” color piece is NOT a filter but a membrane regulator of water pressure. Therefore, suggested in the article way of fixing of the “fill system” problem may cause even MORE problems. Normal position of the regulator is closed (no air goes through). One should be careful NOT to blow pressurized air into the output of the membrane filter. IT WILL LIKELY DAMAGE IT. The only way to blow the air is to blow it from the inlet (the threaded side connected to the pump). This way pressurized air will open the membrane regulator and clean it. But one should be careful not to damage the membrane with excessive pressure. Finally, many thing besides the regulator can go wrong (intake filter, flow meter, pump itself…). Therefore, if “hot water” trick does not work one should systematically check water path. I’d start with removing the regulator and checking that pressurized water comes out of the pump. Use your finger to hold the out coming water and switch pump off as soon as you feel the pressure. If pump is making noise and no water is coming out the pump is broken or no water comes to the pump. If pump is silent – check thermal switch on top of the pump (it is should be on if pump’s temperature is below 115 C). 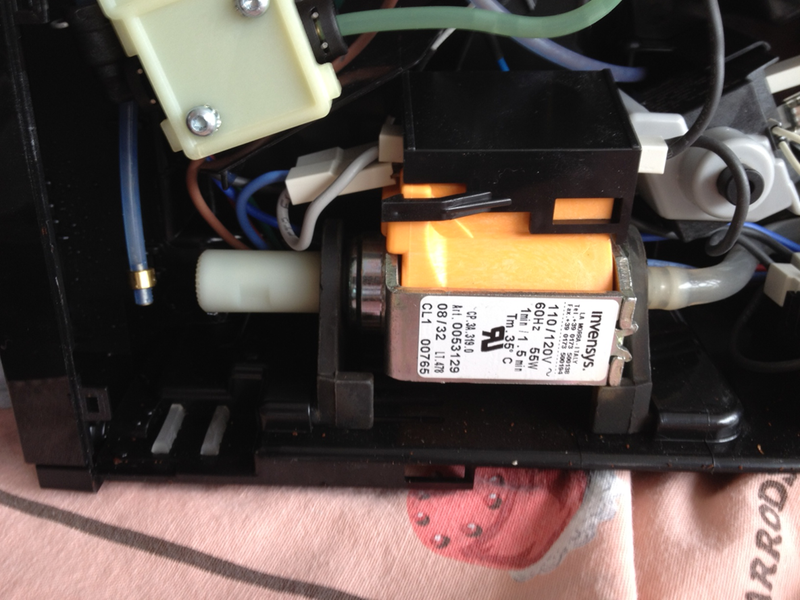 If the switch is on but pump is silent – pump is broken. Check that water is coming to the pump. Remove rubber tube from pump’s inlet – water should come out from the tube if water tank is filled with water. One can remove the tank and blow air into the tube. Air should come out of the water inlet (which is located under the tank). If air is not coming out the path should be checked and cleaned. I think the most common cause of the “fill system” problem is air bubbles in the system. Try “hot water” trick first. If this does not work you’re likely facing a more serious problem (regulator, pump, else). Also remember that pump may “work” but do not provide enough pressure to open the membrane regulator. This will also cause “fill system” problem. Anyway, solution of this problem can be a bit more complicated than the one described in the article. I hope this helps. Don’t damage you membrane regulator by blowing high pressure air through it. Good luck. Thanks for the technical details Vladimir. You clearly know your stuff and it is appreciated! Thank y so much for taking the time and putting together very detailed explanations. I have Jura Z5 that gave me System Fill error on Cappuccino cycle and after a while just “dyed” on me. 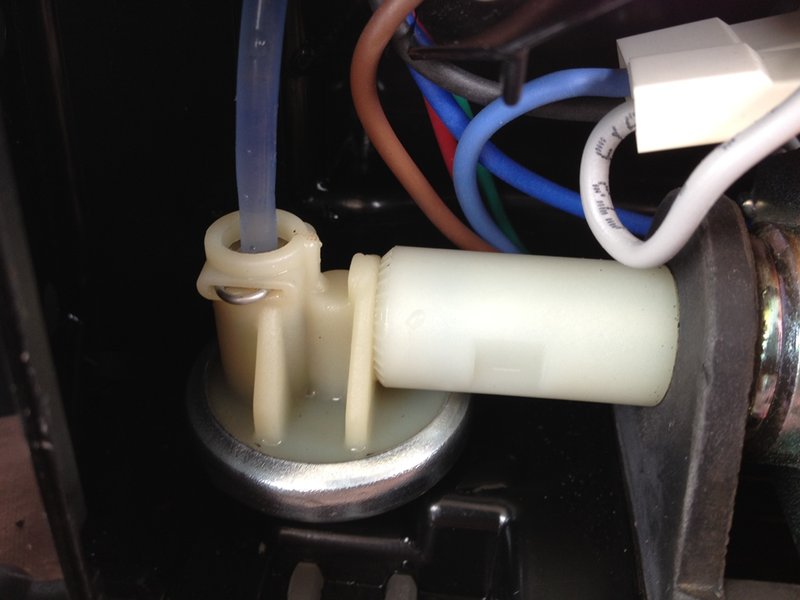 Thanks to your post I was able to find the problem – it was water pump – and replace it. I have my copy machine back!!! And saved some money doing repair myself. Thanks for the information, just purchased a Jura S9 off of Ebay and I’m having all sorts of problems. I’m really upset because it actually worked when I got it but it had leaks . also was running out of steam. I took the whole thing apart and replaced all the seals and checked all the lines for blockage. I think my diaphram pressure regulator is a problem as when off the machine I can orally blow through both sides, this I feel is keeping the pump from building proper pressure. Also, when rebuilding the brew group I put the aluminum cap on the valve end, it fit very tight not sure of the position. Question, where are the micro screens actually located? at the pump inlet? or the regulator inlet? Anywho, guess I’ll try more fiddling. good article thanks for everyone’s input. michael you saved my wednesday morning. had i not googled and stumbled upon your experience i would be dead in the water. i didn’t really care if you got the tech jargon right, i still got it, but when you add it with vladimir’s post – it makes a bit more sense on the techie side. i wanted to thank you both for giving people like me this gift. i wasn’t so lucky as some of you wrote. i had to pull my panels off. i had to go through multiple screws to get to the area that michael is talking about. it wasn’t easy.. the single screwdriver and a screwdriver can be had off of amaz()n or 3bay, but i found it on the cheap. anyone else needing the set just look for “Security Fastener Screw 102 piece Tamperproof Screwdriver Tool Kit Set” and you’ll run into it. its the only set i have found with the torx and oval screwdrivers that you need to get to the pump area. this is my small way of trying to contribute and just not take from michaels discovery. thanks again. Thank you, Michael! I had a system filling error on my Jura Z5 and your instructions fixed my machine. At first, I was skeptical because the piece you instructed to put pressurized air through did not on physical inspection look as if was clogged or calcified. I found a YouTube video on how to disassemble my machine and I purchased the oval key on Amazon for $10. After I finally got the panels off and the part exposed, it was super easy to remove. I went to the gas station, used the air station, put the part back in and it works perfectly. Since I went through all the trouble to open it up, I also took off the other side panel and removed the burr grinder mechanism and cleaned it thoroughly. The YouTube video, https://m.youtube.com/watch?v=HlCu5m9isT4, shows how to do this. It was more effort, but I figured it was worth it since I was already inside. I’m glad I did it since it was super dirty inside. Putting it back together is always more challenging than taking it apart. If anyone plans on trying it, I would recommend doing it in one sitting so you do not forget where the screws came from. Anyway, Michael, you saved me a lot of money by fixing this myself. Thank you from one espresso lover to another. I appreciate your effort to post this, with pictures, and such easy instructions. I do not even have the same machine as you, but it still made perfect sense once I opened it up. Now that the machine is also cleaned from the inside, it sounds different when it runs. It is clear to me there is a lot less resistance on the moving parts and my coffee tastes even better. I did not think it was possible! Two years on from Michael’s original post and our Impressa J9 (2 1/2 years old), starting playing up with that same crazy message and on my partners birthday. She was far from impressa-Ed. We did the hot water trick and it worked beautifully. Just as well because when I phoned the service agent here in ACT Australia the machine was gone for 4 to 5 weeks. Thank you all for your input and for Micheal’s hard work. I’ll let my father-in-law know as he has the same machine. I had this endless filling system problem about 2 years ago. I found that tilting the unit to the right has fixed the problem. I just place a section of the power cord under the right side. I know this is very odd and I have no explanation why it would do this. Maybe there is an air leak that sensitive to position. Anyway, that is the only way the unit will operate. Any one have any ideas? Hi, thank you so much for posting the article as I can’t find my manual. Problem occurred after I replaced the filter, as I find now incorrectly. The hot water worked for me. Oddly, my filling system error has been fixed by replacing the water tank. the old one would only work if I pressed down on it very hard. I have a Jura Z7 that started to have the “system fill” issue. The pump develops plenty of pressure but does not seem to have any volume. I was suspecting at 55 W it would gush out. The water just trickles out with no regulator attached. How much water should the pump generate w/o a regulator? I had a similar issue with my Z5. I have had this machine for over 12 years now and know the internals fairly well by now! I have replaced brew units, membrane regulators, the little rubber one way check valves, etc… The latest issue was the same error with the system filling error. I tried hot water, removed the water filter, etc… Non of that worked. I had replaced the membrane regulator about 3 months ago when I did a yearly maintenance (lube the piston, clean the drain valve, etc…). This time it was acting like the system was backup up beyond the regulator. I verified the lines through the heater, directional valve, etc… were all clear. The brew unit itself seemed to be the culprit this time. I had very little flow of coffee from the unit and even rinse cycles were slow dribbling events. I removed the brew unit (side panel behind the water tank). This requires the oval security bit available on ebay. Three screws secure the unit in the machine. Two torx head machine screws and one torx that screws into plastic near the bottom. Once the brew group is out I cleaned up the valve on the bottom and the piston with accumulated coffee grounds. I have had the brew group apart in the past and it’s not for the faint of heart. Yes it’s a very complex mechanical part that has several interlocking pieces. This time I was able to leave most of the brew unit in one piece. The piston screen looked like it was partially plugged with fine coffee grounds. I was able to remove the screw and clean it out. 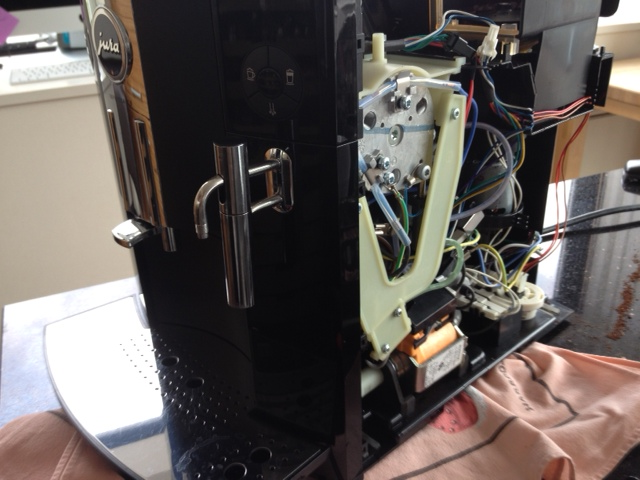 I then removed the check valve assembly that routes the coffee out to the spouts through the top of the brew unit. Behind the check valve was some more fine ground coffee. After cleaning all the pieces I can report it’s making great coffee again and the volume is back to normal with a strong stream of coffee flowing from the machine when it’s brewing. Thanks for inspiring me to tear back into this. I was about ready to retire this old soldier! My wife will likely not be to happy as she was looking forward to a new machine! I’m having a hard time doing that seeing this machine just runs and runs and really has not had any major issues. Thank you! I removed the filter and that fixed the problem. All the “System Fill” error comments are interesting and helpful but my A9 symptoms are very similar to JP Austin’s. I have tried hot water, cleaned hoses and flow meter multiple times. I also replaced the regulator as the first attempt to fix problem. My issues also started after changing the filter. I even tried going without the filter but no improvement. I get about 3 normal flow cups of coffee then symptoms return. The only thing I have not found is the screen filter many talk about. My pump seems to produce plenty of pressure in that when there seems to be something starting the block water flow I can hear what sounds like pressure building in the system but there is no or minimal water flowing. I have no leaking in the system. Please help me find this screen filter as the Jura web site has no real help for A9. I need to clarify what I meant by saying I replaced the regulator. It was the membrane regulator, which is suggested to be the “most common cause” for “system fill” error messages, that I replaced. I’ve had the same error message « système remplit » on french on my ena 9. I fixed it like this : even if i was using a Claris filter, ive forced the descaling (détartrage) program by entering thé program mode. Hello and thank you for posting this. The part you blew out I believe is called the Membrane Regulator. We bought the tool and watched another YT video to disassemble our J5. Held a paper towel in front of the part while running compressed air through it. Nothing on the paper but this worked. Just one word to other J5 owners. On reassembly, you must make sure that the loop on the hose clamp does not touch the housing above, otherwise it will transfer vibration to the housing and make an awful noise.